#IBelieveThatWeWillWin has been running through my head, non-stop, since yesterday afternoon. Maybe it was the result of the Germany-Ghana match. What a stunner, eh? I was pulling for a big, soul crushing win for Die Mannschaft at the onset of the match. I felt it best to eliminate our pals from Ghana, to make...er...improve our hope for knockout stage glory. I've come to realize that the draw makes things even more freaking interesting for today's bout against CR7 and the Hairdos. If we can pull off the win, we'll own the top spot and qualify for the round of 16. Two matches in, and we could be heading to the elimination round. Lets not get in front of ourselves. The German win was a little bittersweet in Brazil, however. With Klose's game tying goal, he tied a very personal record for Brazilians, Ronaldo's (the Brazilian one, not the haircut) record 15 World Cup goals tally. Granted, Klose is like 90 years old and has been in one more Copa do Mundo than Ronaldo. It still stings. Another reason for my glee and confidence may be the "neat" moment at a Manaus restaurant yesterday evening for dinner. Seated at the table next to ours was famed Brazilian footballer Pedrinho. Well, I just learned about him yesterday, but all of the people at the place were coming to get his autograph and not mine. Therefore, he is way more famous than I am in Brazil. The nerve! Perhaps it is just because the game is just a few hours away. That's most certainly it. Time to gear up and lace up my red, white and blue boots. Wow. What a rush it was to experience the kick off of the world's game's biggest event--the FIFA World Cup Finals--in the very city that the opening match took place! Yesterday was a day filled with anticipation by all involved, especially the fans and teams from Brazil and Croatia. A late morning walk along Avenida Paulo VI (known locally as Sumaré) provided a great view into the pre-match build up of excitement and host nation pride in their Seleção. 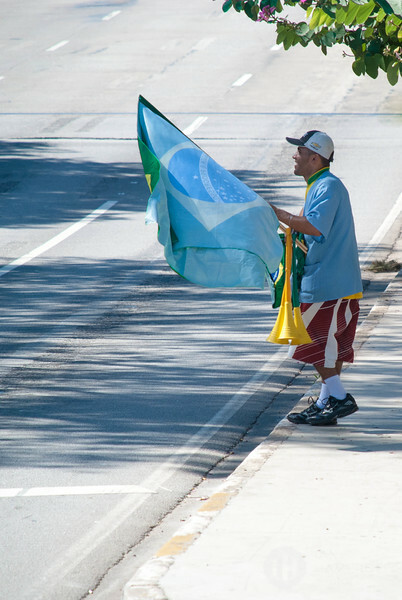 This guy was out quite early, armed with Brazil flags and a number of vuvuzela like horns (even though vuvuzelas have been banned for the 2014 tournament). As the day continued, more flags, horns, firecrackers and fans made their way to the streets. At least 1 out of every 10 cars had some form of the Bandeira do Brasil. It even got challenging to conduct meetings from my remote location, as both the noise from the streets and the flakey Internet connectivity made for some interesting conditions on my Lync calls. We watched the match from the comfort of our São Paulo base of operation, complete with a healthy spread of treats and tasty caipirinhas. The match got off to an inauspicious start thanks to Marcelo's horrid own goal in the 11th minute. I'd be lying if I said spirits weren't low, bordering on worried until Brazil's jewel Neymar netted an equalizer 18 minutes later. I don't need to recap the match's storyline, which included some questionable calls that leaned mostly in the host nation's favor. 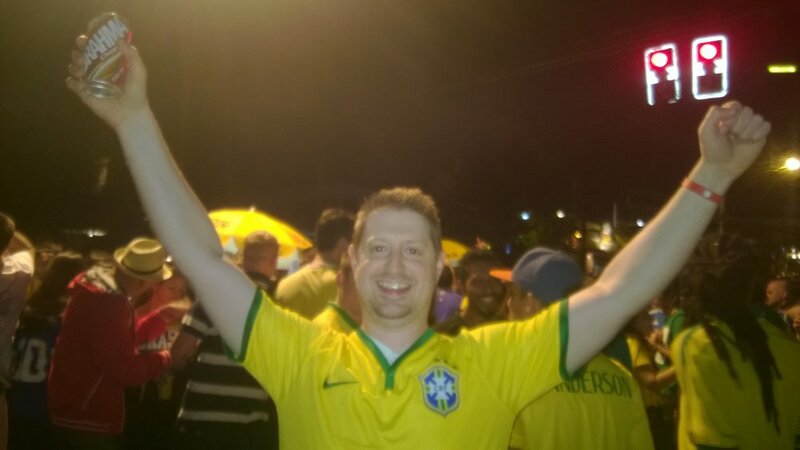 Instead, here's a peek at what happened in the streets near our viewing party after Brazil's 3-1 victory. About 15 minutes following the final whistle and a little bit of clean-up, we headed out to experience the celebrations along the bar area of Vila Madalena (a nearby neighborhood). The police had cordoned off several blocks to allow for outdoor viewing of the match and consumption of adult beverages. The party continued until late in the evening. Everyone was good natured and while it was no small task to navigate through all the masses of humanity gathered, we didn't feel unsafe for one minute. We were even able to score a table at Bar Genésio where we ate some Brazilian pizza and chopp (Brazilian draft beer). After our late snack, we headed back out into the sea of celebrating humanity to make our way back home. The experience was fantastic and has served as a great personal kick off for our own World Cup adventures. Bright and early tomorrow morning, we head out to Natal to start the process of following the USA in the Group Stage. Stay tuned! Last night before we headed out for a late dinner at a tasty local restaurant, the evening news broadcast showing on the living room T.V. was interrupted for a televised address from Brazilian president Dilma Rousseff. Thanks to the closed captions, my rudimentary Portuguese and help from my in-laws, it was clear this speech aired the evening two days prior to the opening ceremonies was meant to rally the nation to support the Copa do Mundo with the same passion and gusto Brasileiros have supported their Seleção to a record five World Cup wins over the tournament's 85 year history. As you've may have noted from the coverage of the ramp up to the World Cup, the host nation has suffered both protests and strikes, raising issue with the level of investment made in building stadiums over investment in the needs of the citizens. Dilma's speech was aimed solely at addressing this criticism and as this post to ProSoccerTalk sums up nicely, "urged [citizens] to support the World Cup." While I have no designs on commenting on who's right or wrong here, this NBC News Infographic did catch my attention. Sourced from the government's own facts and figures, it details the amount of money being spent on just the security for the 31 visiting national teams and the expected 3.7 million tourists coming to witness the games first-hand (like me). As a "citizen-in-law" to Brazil, I do hope the growing divide between the rich and poor sees improvement over these coming years. As an outside-ish observer, you hope with both the 2014 FIFA World Cup and 2016 Summer Olympic Games in Rio bringing the world's attention to Brazil, this will motivate the government to take the right action. Just like Justice Louis Brandeis has been credited to have said, "Sunlight is said to be the best of disinfectants." Our short discussion on this topic over dinner last night (which included linguiça, bolinho de carne seca com arroz, and carne seca), my wife did comment that the level of excitement was much lower than she's experience with past World Cups. That the streets, while adorn with Brazilian flags, are not as decorated as she expected. Maybe once the games get started, and memories of Brazil's successes in the World Cup warm-up during the 2013 Confederation Cup are rekindled, enthusiasm will be at expected levels in São Paulo and across the nation. I'll keep you posted, especially as we travel to other host cities. In the meantime, I think it's time to dip into the leftovers from last night's feast before my Seattle time zone meetings get started for the day.